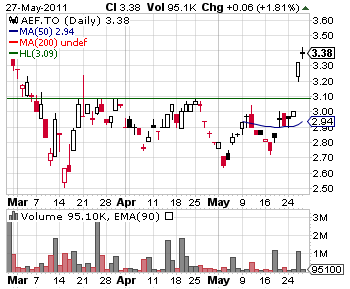 Aurora Oil and Gas Ltd (TSE:AEF) (PINK:AAGLF) stock gaped up with no news in support and ended the trading week with a premium. The price action is questionable though and points to possible collapse over the next week. AEF price jumped 10.6% on Thursday out of the blue and some of the momentum continued into Friday, but it also showed signs that correction will likely take place next week. The price action formed a spinning top candle over the last trading session, which usually marks the end of the rally in play. Trading volume was 1.11 million, three times the average upon the gap up on Thursday, but dropped below the average on Friday. Combined with the spinning top candle, this confirms that traders lost interest in the stock. That is not surprising since AEF had no actual news to support the buyers. The lack of catalyst caused traders to be cautious. •	18 wells are producing.